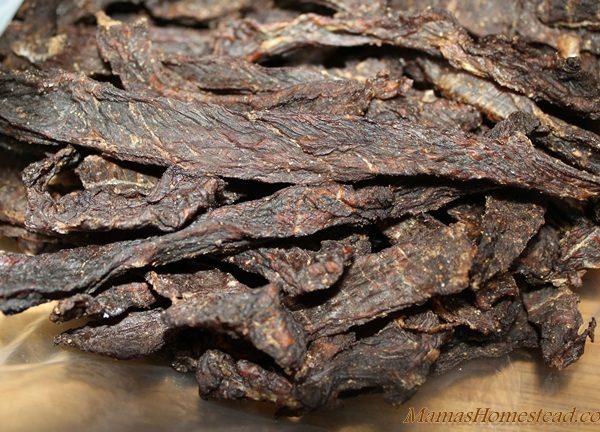 Fruit Leather can be made from nearly any ripe fruit, peaches, apples, pears, and mangoes are good choices. 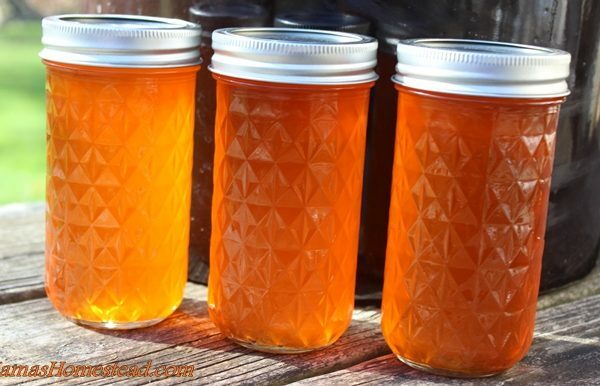 It is a delicious way to preserve your harvest. Wash and coarsely chop your fruit. 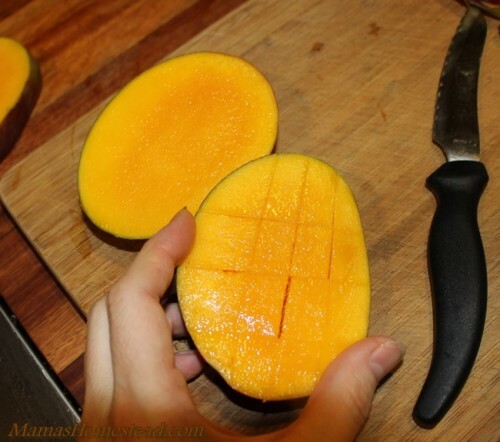 Here is the simplest way I have found to cut up a mango. 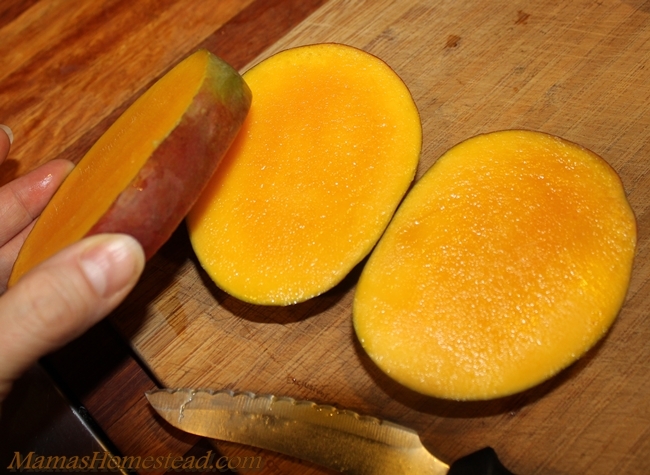 Hold your mango on your cutting board with the stem facing down, narrow side facing up. You will see a line going all the wayaround the center of the mango. Cut about 1/4″ from the widest center line on each side of the pit. You will have two ovals of mango flesh and a center that is mostly mango pit, with a little flesh left. 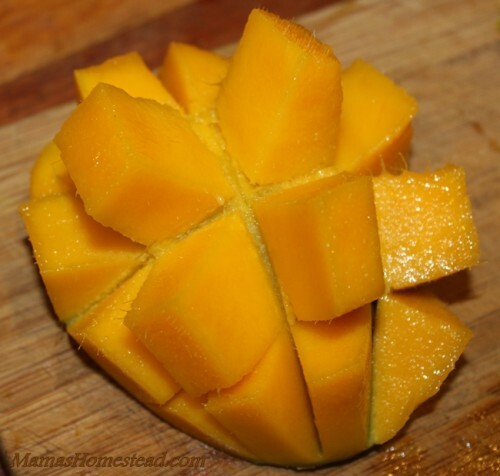 Cut cubes into the oval mango flesh in a checkerboard pattern, similar to an avocado. Be careful not to cut through the skin. I place it on a cutting board, just in case the knife goes through, so I don’t cut my hand. 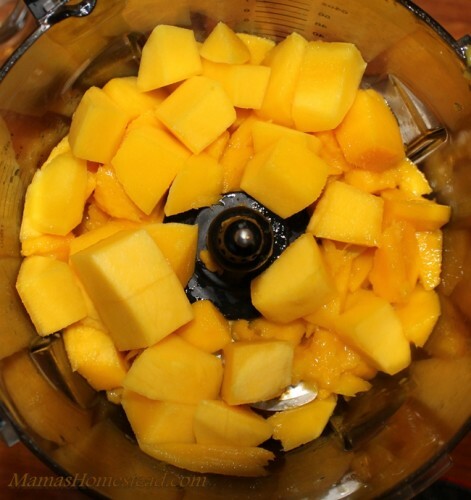 Turn the cut mango ovals inside out by using your thumbs to push the skin up from the bottom and pull the mango chunks off of the skin with a spoon. Peel the skin off the pit slice and cut or scrape the rest of the flesh from the pit. Place mango chunks in a food processor or food mill. Add lemon juice and sugar. Puree until smooth and sugar is dissolved. Line a baking sheet with parchment paper or use a sheet lined dehydrator tray. Pour the puree mixture onto the baking sheet or dehydrator tray in ¼ cup portions. 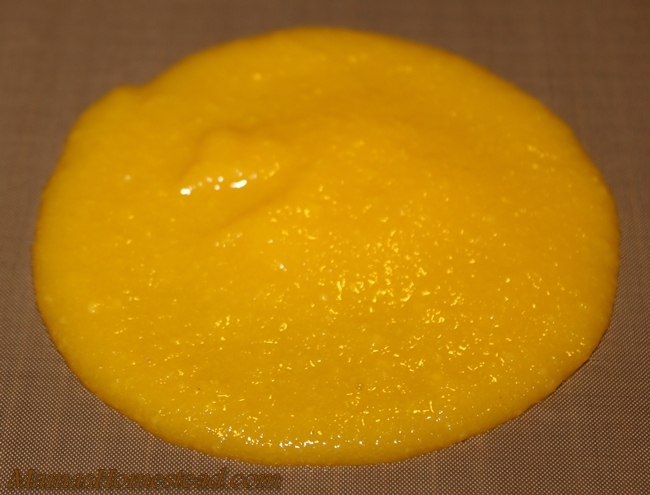 Spread puree to 1/4 inch thick. Place baking sheet in an oven or place in dehydrator at 135 degrees for 7-10 hours or until dry, but still pliable. 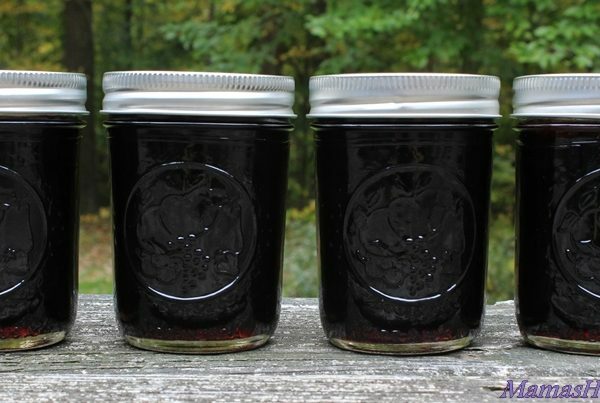 (Times vary depending on the type of fruit and sugar content). 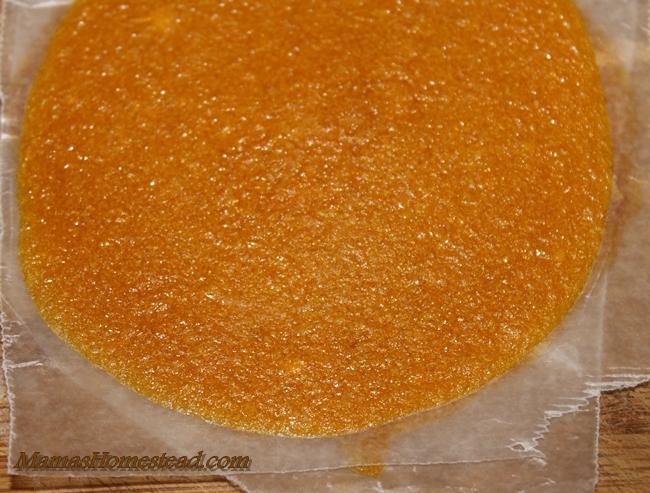 Allow your mango fruit leather to cool, peel off the parchment paper or dehydrator liner. Place waxed paper between each piece and store in an airtight container. Tip: If your fruit leather is brittle, try adding more sugar next time you make it. Thank you for visiting Mama’s Homestead! Wash and coarsely chop your fruit. 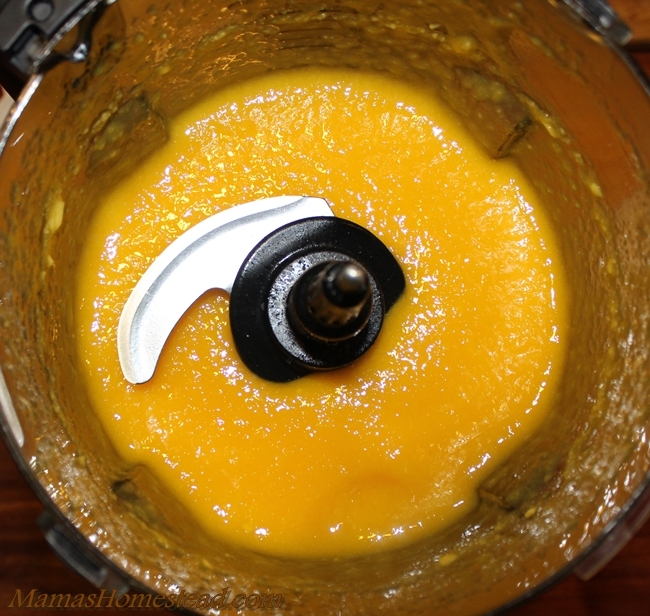 Puree prepared fruit in a food processor or run through a food mill. Add lemon juice and sugar; stir until sugar is dissolved. 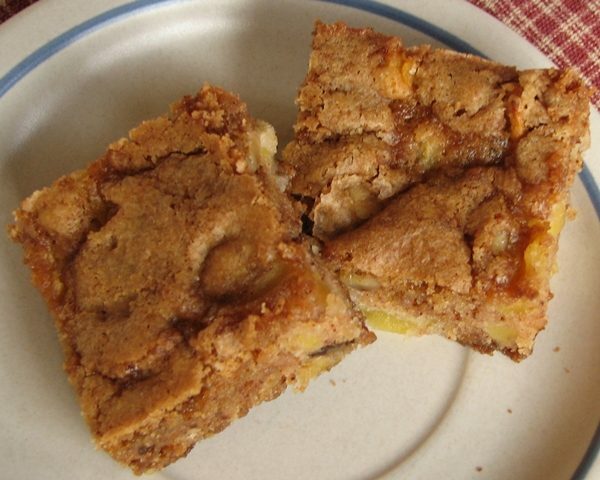 Place baking sheet in an oven at 135 degrees for 7-10 hours or until dry, but still pliable. (Times vary depending on the type of fruit and sugar content). Allow the fruit leather to cool, peel off the parchment paper or dehydrator liner. Place waxed paper between each piece and store in an airtight container.